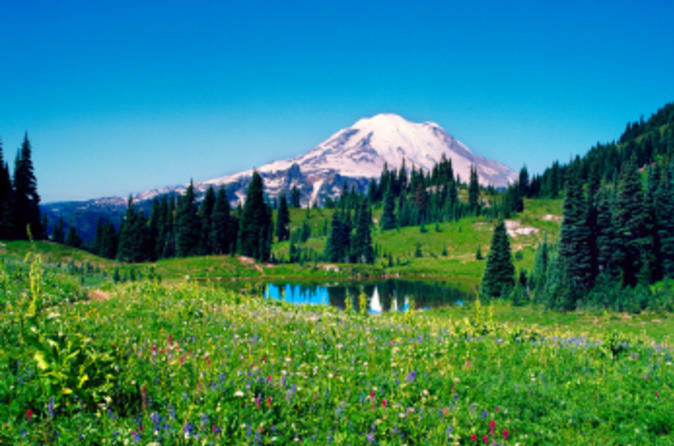 Breathtaking vistas await you on Mt Rainier, whose rocky peak stands more than 14,000 feet (4,267 meters) tall! On this full-day tour to Mt Rainier from Seattle, you’ll get to appreciate the beauty of this stunning mountain up close. Enjoy unobstructed views of the Seattle area from the mountain. Don't forget your camera -- this 10-hour day trip is a feast for the eyes! Your tour begins with a comfortable, scenic bus ride. Stop at the visitor’s center before continuing to Mount Rainier National Park. Enjoy lunch (own expense) at the world-renowned Whittaker School of Mountaineering, where a 30-minute slide show will take you on a visual journey to the summit, presented by a professional Mt Rainier guide. On your way to Paradise, the mountain’s visitor’s center famous for its magnificent views, linger at several lookout points and gaze at the awe-inspiring scenery and natural wonders. Admire crashing waterfalls, diverse plant life and the picturesque snowcapped summit. In the late afternoon, follow a different route back to Seattle and take in even more fantastic Pacific Northwest scenery.